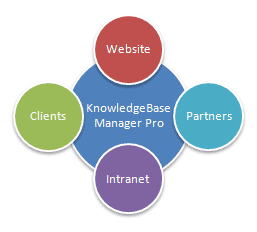 Knowledge Base Manager Pro is a Rich Internet Application, which conception relies on long-term experience of Enterprise-class software development. It has all approaches, necessary for usage in commercial purposes, implemented. Revolutionary technologies in Rich Internet applications development field are used in Knowledgebase Manager Pro. 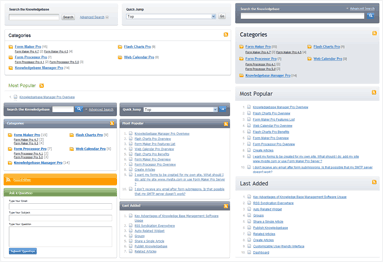 This is the first and the best Web2.0 Knowledge Management Software that uses Ajax technology and Web 2.0 trends in full, providing high acceleration, greatly increasing functional capabilities, and having fine-tuning potential for use in any data domain, in any context, and in any format. Multiple ways of knowledge base publishing. Publish the whole knowledge base as a multifunctional article directory, share a single article to any web page, or use semantic linking of existing website content with knowledge base articles. Data recovery, article history, and backup mechanisms to keep knowledge base safe. Use recycle bin for deleted articles, rollback to previous articles version or restore the whole database from the backup within application. Built-in software updater. Check for updates by clicking on the one button and update to the latest version with the help of simple wizard. User and group management system. User groups simplify access control to knowledge base. Each group aggregates specific user rights and user assigned to this group inhabits its access permissions. Related articles integration to existing website and inner usage in the knowledge base. Put the Widget with automatically related articles on your website or use it within the knowledge base. Use various ways to read articles. Except plain browsing of the knowledge base and reading the articles as is, it is also possible to subscribe by RSS or email, print printer-friendly version of article, and share interesting article with friends in few clicks. And more than 30 other powerful features of our web based Knowledge Management Software Solution, that helps you to optimize your business! 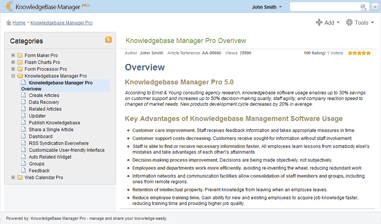 Knowledge Base Software of your choice – Knowledge Base Manager Pro!